I'm a Dogist. Yep, ah huh, I said, Dogist. I believe in dog... Dog is my co-pilot... Dog is good... Honk if you love Dog... you know...a Dogist. Without dog, I wouldn't be a photographer. 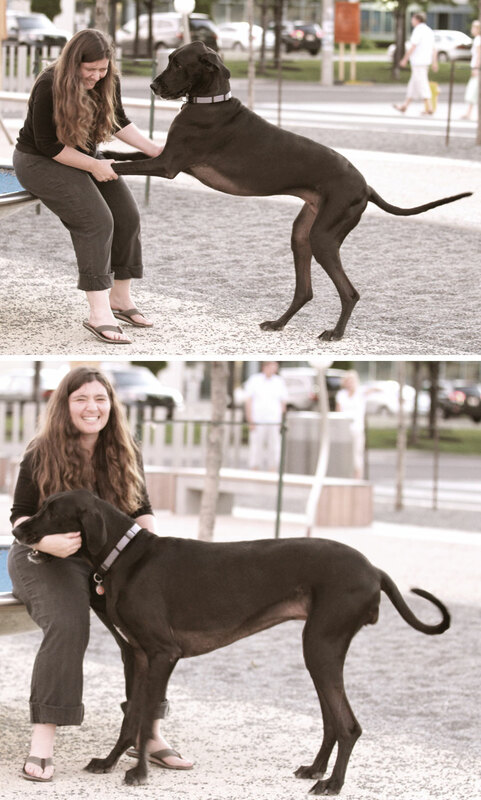 I got into the business of shooting Love by way of my first Great Dane, Ishie. She was my heart and soul. The love I have for her is unparalleled. We were a very bonded pair. She had to just look at me and I knew what she wanted or needed. I don't know why or how that happened, but it did and it was beautiful. The lifespan of a dog is something like 7-13 yrs. That's it. So, when you have a dog that you love madly and you can finally reconcile the ugly truth of their lifespan, the next thing that happens to you is that you have this frenzied desire to capture every single moment you can, no matter how trivial or un-instagrammable it may be. Moments are everything. I have a photo of Ishie sniffing a blade of grass that makes me sob! She loved discovering new smells. She could spend a solid two minutes sniffing a single blade of grass. If I took her to the same park two days in a row, she would rebel. She'd simply stop and refuse to go in. Upon entering the park she'd stand and stare at me as if to say, "Been here, smelled it. What else you got?" So we visited Toronto parks on rotation. I love that posed photo of her and I at the top right, but it is images like the photos on the left that jump-start my memories. She used to get so excited when I went down slides or spun around on playground saucers. She would make me laugh so hard with her clumsy great dane dance. My laughter would get her even more excited, so she would gently grab my hand with her mouth and pull me to play chase with her. So, when it comes to shooting your engagement, elopement or wedding, I arrive with that pre-programmed into my mind: "Moments are everything." Twenty years from now I want you to look back at your photos and remember exactly how romantic you and your partner were or exactly how funny it was when something ridiculous happened while you were at the alter or how sad+happy you were during that first dance with your dad. Moments are everything and Ishie is how I how discovered that. She is gone and my heart has never been the same. But all these photos I have of her and her moments are what breathe life and comfort into a world without her.